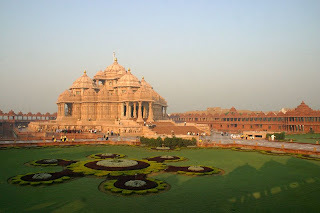 Delhi Akshardham Temple, also known as BAPS Swaminarayan Akshardham Temple, is an exquisite Hindu temple complex, situated in New Delhi, Delhi Capital of India. Built on the banks of the River Yamuna adjacent to the 2010 Commonwealth Games village, Akshardham Temple complex depicts traditional Indian and Hindu culture, spirituality, and ancient architecture. Swaminarayan Akshardham Temple complex consists of the Swaminarayan Temple of the main monument, exhibition halls, an IMAX theatre and a Musical Fountain, bounded by a large landscaped garden. Akshardham complex also features a restaurant named Premvati Food Court which is a replica of the Ajanta and Ellora caves in Maharashtra, and an Ayurvedic bazaar. Swaminarayan Akshardham Temple complex is regarded as the World’s Largest Comprehensive Hindu Temple in the Guinness World Records. At the center of BAPS Swaminarayan Akshardham Temple is the main monument which is covered top to bottom with beautiful carvings. This main monument which houses the idol of Lord Swaminarayan is constructed according to the ancient Vedic principles of Vastu Shastra and Pancharatra Shastra. The deity is surrounded by statues of the gurus of the same sect. Each idol is made of paanch daatu or five metals. There are also murits of other Hindu deities, such as, Sita Ram, Radha Krishna, Shiv Parvati, and Lakshmi Narayan. The temple is built without steel, in a combination of northern Indian architectural styles - Rajasthani, Orrisan, Gujarati, Mughal and Jain. Erected completely from Rajasthani pink sandstone and Italian Carrara marble, Akshar Dham monument consists of 234 ornately carved pillars, nine domes, 20,000 murtis and statues of Hinduism’s sadhus, devotees, and acharyas. Gajendra Pith is an important element of the Swaminarayan mandir. It contains 148 scale sized elephants, few birds and animals, human sculptures and decorated stone backdrops of trees, creepers and royal palaces. The temple complex was built by Bochasanvasi Aksharpurushottam Swaminarayan Sanstha (BAPS). Other tourist attractions in Swaminarayan Akshardham Temple Delhi include Yogi Hraday Kamal (a sunken garden shaped like a lotus), Nilkanth Abishek Mandapam, AARSH Centre (Akshardham Centre for Applied Research in Social Harmony), and Premvati Ahargruh (a vegetarian restaurant designed in the modeled on the Ajanta and Ellora caves in Maharashtra). Narayan Sarovar, a lake that surrounds the main monument is another attraction of the temple complex. There are 108 gaumukhs symbolizing Janmangal Namavali or the 108 names for god surrounding the Narayan Sarovar Lake. Swaminarayan Akshardham Temple complex is opens from 10.00 am to 7.00 pm (April to September) and 9.00 am to 6.00 pm (October to March). The complex is closed on Mondays. Entry to the Swaminarayan Akshardham Complex, Mandir and Gardens is FREE. However there are tickets to view the Exhibitions. Where is Akshardham Temple located – The temple complex is located on National Highway 24, near Noida Mor, New Delhi 110092. How to reach Swaminarayan Akshardham Temple Delhi? Nizamuddin Railway Station (4 km) is the nearest railway station to reach Delhi Akshardham Temple. New Delhi Railway station is another major railway station, situated 10 km from the temple complex. Delhi Akshardham Temple of Swaminarayan is located on the National Highway 24 (NH 24) in East Delhi, near Nizam-ud-Din Bridge. Delhi is well connected to all major cities and towns of the country by road transports. Delhi International Airport is the nearest airport to reach Akshardham Temple.